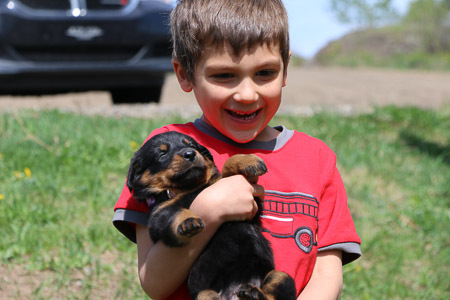 My puppies are raised according to Avidog�s development and socialisation standards. My puppy rearing program includes mental development and stimulation, social and physical development, optimal nutrition and health. Early socialisation (my puppies meet a lot of people during their first 8 weeks, people of all sizes, ages, shapes). faster maturation and better problem-solving abilities later in life. *Early Scenting Stimulation (ESI) is a way of stimulating the puppies sense of smell. It helps develop interest in scenting, the ability to detect scents and the ability to follow scents. 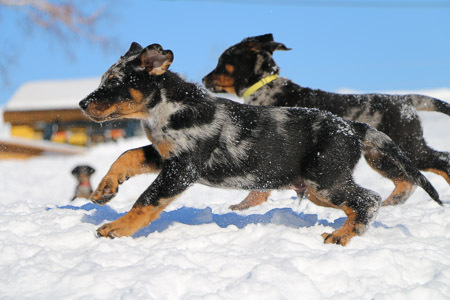 It is particularly intersting for dogs that will perform in work or sports that involves scenting abilities such as tracking, obedience trials, search and rescue, odor detection, etc. From days 3 to 16, you present the puppies once at a time with some time of novel scent to sniff. These scents can and should vary from natural outdoor scents (like leaves, grass, dirt, flowers) to pungent herbs and spices (cinnamon, sage, ginger etc) to fruits and veggies (lemon, banana, green pepper�), and also scents associated with sports or activities they may be involved in as they mature (tennis balls, leather gloves, sheep wool, etc).